Every four years, I write some variant of this column, which drives my friends (and not) who are soccer crazies absolutely berserk, in significant measure because they know deep down in their soccer-crazy hearts that I am right, that no matter how much they might wish otherwise the United States is not a soccer nation. This time, I don’t even have to wait four years, until 2018 and World Cup time. Three years will do just fine. In Cup qualifying, the U.S. men’s national team lost Tuesday night, 2-1, to Trinidad and Tobago at Ato Boldon Stadium (shout-out to Ato!). The U.S. guys are out of next summer’s tournament in Russia. Iceland is in. The United States is out. Iceland has maybe 335,000 people. The United States has roughly 323 million. Almost everywhere else around the world, soccer is No. 1. In all those countries this Wednesday, we Americans are a joke. A bad joke. President Trump, and now this? How can it be that the United States — the United States! — cannot qualify for the men’s World Cup? Why? Because the United States is not a soccer nation. Only in a country where soccer is not truly a thing could the karma gods be so exacting that the U.S. Department of Justice opts to make itself the world’s self-appointed soccer marshal in the FIFA matter and then the men’s national team flames out in qualifying. Hey, who knows? Karma works in mysterious ways. Wish you all might otherwise, soccer crazies, but soccer is not our culture. In our actions and in our values, we make it plain that we overwhelmingly prefer football, not futbol. That is the hard truth. 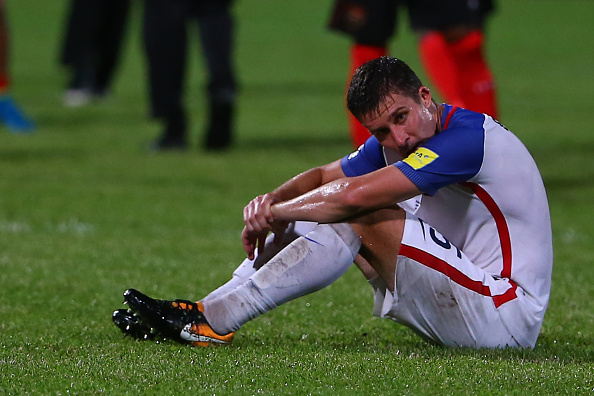 It may take a generation — even with the prospect of a men’s World Cup back in the United States in 2026 — to move ahead meaningfully from Tuesday’s loss. This failure is indeed that devastating. It’s a failure of talent, leadership and, essentially, culture. After a dismal performance at the 1988 Winter Games in Calgary, the United States Olympic Committee faced a similar crisis. In response, the USOC commissioned a study led by George Steinbrenner — yes, that George Steinbrenner, who was also a USOC vice president. The Steinbrenner Commission report, issued in 1989, directed the USOC to focus on winning medals. Since, that has been the USOC’s key mission. It also urged the USOC to change the way it trained and paid athletes; in response, the USOC created grants and training programs. The proof of the Steinbrenner Commission’s success can be read in the medals counts at recent editions of the Games, Summer and Winter. U.S. Soccer needs to undertake its own version of the Steinbrenner Commission. The federation president, Sunil Gulati, should not be part of that study in any way, shape or form. The signal is clear when you are both responsible for and accountable to a program that doesn’t qualify for the sport’s biggest event for the first time since 1986: thanks, and it’s someone else’s turn at the top. The U.S. has a built-in advantage: the university system. How to use it? That is, how to use it while acknowledging fiscal realities and, as well, without diminishing in any way the import and advancements due to Title IX, the 1972 federal law that mandates equal opportunity for women in athletics and academics. Are those fiscal realities changeable? If so, how? And how long might that take? To change, you first have to acknowledge reality — not just, as the soccer crazies so fervently would wish, some alternate version. How’s that working out for you, too? The rest of America? Which may or may not be aesthetically minded? Are all those people expected to grovel or what if, as elsewhere in the story, they are not cool enough for this "too-cool" sport -- like the 30-year-old Williamsburg production assistant "with flowing dark hair"? You want to know why our country is slogging through gruesome culture wars? Talk about a bad joke. Here's a better play: at a Nebraska tailgate, it's, like, hey, wanna beer? We all must acknowledge not only that in our United States of America football is king — that the NFL rules, that college football dominates — but, as well, the many and varied reasons why football is king. Cry, cry, cry all you want otherwise. Sure, one-off soccer events, especially those in big markets featuring European powers, can draw big crowds. Americans like big events. That proves nothing — zero — about the United States as a soccer nation. Let’s send Jim Harbaugh and his khakis onto High Street in Columbus. Next, let’s send Christian Pulisic. ETA before the riot police show up to ensure Harbaugh gets back to Ann Arbor with the crease in his khakis intact? For those who would like to scream that football is dying: as if. Every season, the National Football Foundation & College Hall of Fame tracks the number of teams playing ball. From the Aug. 1, 2017 release: across all NCAA divisions, the NAIA and independents, the number of schools offering football is up to 777, an all-time high. In the past six seasons (2011-16), 40 programs have added football; 13 were dropped during the same six seasons, including four at schools that closed and the University of Alabama at Birmingham, which reinstated football in 2015 just six months after shutting it down; they raised $38 million and moved into a new football operations center. The Aug. 31 Ohio State-Indiana game, according to ESPN? Just ESPN’s most-watched opening weekend Thursday game ever, up 172 percent over last year’s opener, South Carolina against Vanderbilt. One, viewership numbers compared to last season have improved each week this season. Two, if that trend line holds, cumulative viewership will exceed last year’s by Week 11 of the NFL’s 17-week regular season. For those who would like to scream that football has a concussion problem: uh, soccer, too. Why does football rule? The feeder system is embedded in American life: Pop Warner up through middle school to high school to college to the NFL. In high school, and this is fundamental, playing football typically makes for a sign of status, athletic and social. Even more important, football is a means to college, and thus to opportunity, in a way that soccer is not. Each of the 129 teams playing Division 1 football in 2017 can offer 85 individual scholarships. Moreover, you have to stay in college for three years before you are eligible for the NFL. Every little kid in America, it seems, plays soccer. But at the D-1 level, men’s soccer can offer a team total of just 9.9 scholarships. But that’s just the start of the math. Soccer is what’s called an “equivalency” sport. Typically, this means that if you’re playing soccer you don’t get a full ride but only a partial scholarship. NCAA D-1 men’s soccer teams have an average roster size of 29. Per the website scholarshipstats.com, with a max of 9.9 scholarships per team, the average award typically covers only about one-third of a typical athlete’s college costs — and this assumes that at the particular school soccer is fully funded. Does anyone worry whether at a particular school football is fully funded? Of course not. See Alabama-Birmingham. This is why the United States is not a soccer nation. Qualifying for the World Cup is a bare minimum. The World Cup semifinals? Back to Brooklyn, and a bridge I’d like to sell you. To effect the sort of change that would see the United States become a serious world contender in men’s soccer means taking advantage of the one thing the American way has over the rest of the world — the university system. Why are the U.S. women so good? Because of Title IX. For 45 years, it has afforded young American women opportunity. Christen Press, for instance, went to the same K-12 school my own three kids attended in Palos Verdes, California. Then she went to Stanford. Now she is a regular on the U.S. women’s team. Title IX is the reason the U.S. women dominate in basketball. It’s why the U.S. women often dominate internationally in — pick whatever sport you want. It’s why the U.S. women in recent years have been the medal leaders at the Olympics. The NCAA system, indeed, is the crucible to which the world sends its best track and field athletes (Ato Boldon! UCLA! ), its best swimmers, its best seemingly everybody — except in men’s soccer. This is culture. We have it. In everything but men’s soccer. No one is saying — to reiterate, the suggestion is not, not, not — that Title IX should be weakened, or that the gains U.S. women across the board in sports have made should be weakened just so the U.S. men’s national soccer team can or should be improved. But if you soccer crazies really want soccer to be good in the United States, you have to be real. The United States boasts an amazing university system with world-class infrastructure. We are wasting it, at least when it comes to men’s soccer. It’s going to take time, a long time. It’s going to take a lot of money, too. Where is that going to come from? Unclear. To reiterate: completely uncertain. But if we can put a man on the moon — surely, we can figure out how to fund soccer. It’s a matter of priorities. T. Boone Pickens has had no compunction supporting Oklahoma State football. Which, once more, cuts to the core of the matter. Since 1977, since Pele and the Cosmos, I have been hearing that soccer is the next big thing in the United States. 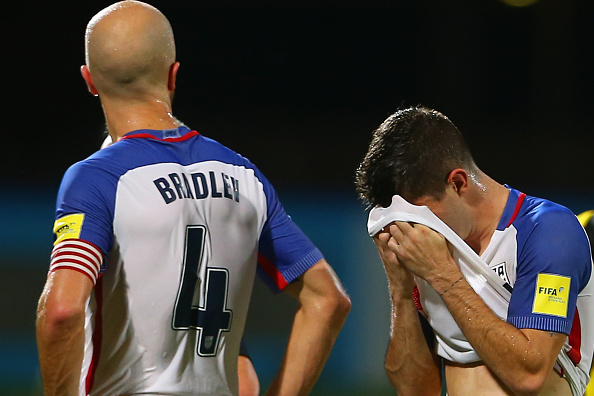 The U.S. men, with seemingly every advantage and resource at hand, lost to Trinidad and Tobago. That’s, frankly, a bad joke.